Don't Feed the Plant: re-imagining the ending of "Little Shop of Horrors"
(...) We went to San Jose for the first preview and everyone was very excited about it. For every musical number there was applause, they loved it, it was just fantastic … until we killed our two leads. And then the theater became a refrigerator, an ice box. It was awful and the cards were just awful. (The audience was) saying that they hated us for killing them. You have to have a 55 percent “recommend” to really be released and we got a 13. - Director Frank Oz, recalling a test audience’s chilly reaction to the original ending of “Little Shop of Horrors”. The 1986 movie version of “Little Shop” departed in one very significant respect from the off-Broadway hit musical upon which it was based. In the original stage and screen versions of the story, the villain - a jive-talking, extraterrestrial botanic carnivore nicknamed “Audrey 2" - wins the day, devouring both likable but ethically flawed hero Seymour Krelborn and his sweetheart, the heartbreakingly kind Audrey (after whom the plant-monster was innocently named). 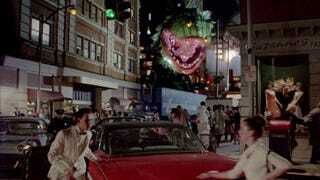 Gigantic Audrey 2 creatures then embark on a ‘50s-style monster movie rampage through New York City, en route to implicitly devouring everyone on Earth. The dark but forceful moral is urgently expressed in the last song - “Don’t Feed the Plant!” In the context of this story, that means don’t sell your soul. There was not a dry eye in the house. A 2002 Director’s Cut DVD release included an extended version of the original ending, post-Audrey’s tragic death. After a one-sided “battle”, Seymour is eaten alive. The chorus offers a somber and rather threatening coda, and then gigantic, gloating Audrey 2 aliens smash their way through New York City while howling with laughter. Despite its basically absurd nature as a parody of ‘50s and ‘60s “giant creature feature” movies, this spectacular sequence - coming hard on the heels of the tragic deaths of both protagonists - left the original “Little Shop” test audiences in something close to despair. I learned a lesson: in a stage play, you (can) kill the leads (but then later) they come out for a bow — in a movie, they don’t come out for a bow, they’re dead. They’re gone and so the audience lost the people they loved, as opposed to the theater audience where they knew the two people who played Audrey and Seymour were still alive. They loved those people, and they hated us for (doing that). Without the meta-theatrical moment of emotional catharsis afforded by the curtain call, the climax of “Little Shop of Horrors” is incredibly bleak. Realising that their movie was un-releasable, the creative team made the hard call to completely reconceive the ending. The extremely impressive (and expensive) “rampage” sequence was replaced with a new and much happier ending. In the released version, Seymour rescues Audrey from the plants’ jaws and then manages to destroy their nemesis by jabbing one of its tendrils with a live wire. The happy ending did its job. The next batch of test audiences reacted very positively and the movie went on to earn respectable box office returns, widespread critical acclaim and a strong cult following among fans. The new ending also, however, came across as saccharine and there’s no question that it diluted the force of the original moral. As hapless and likeable as Seymour is, he’s guilty of at least being complicit in the deaths of two people and of feeding their bodies to a carnivorous alien plant-monster. If, as shown in the new ending, he goes on to live a happy life with his one true love, then why not Feed the Plant? Sell out, do awful things, it’ll probably be OK as long as you can find a live wire when you really need one. Audrey in munched by the plant. Seymour pulls her free, but it’s too late; mortally wounded, she just manages to reprise “Somewhere That’s Green” before expiring. Grief-stricken (along with the audience), Seymour complies with her final wish and feeds her body to Audrey 2. Then, finally realising that the plant-monster is the vanguard of a conquering alien species, Seymour tries to kill it, but is defeated and devoured. The chorus comes on in front of the giant American flag and delivers their somber coda. THEN - and this is the new idea - the camera pulls back to reveal that the giant flag is actually a movie screen. The Stars and Stripes flicker and now the singing chorus is standing between us and the images of the beginnings of the Audrey 2 invasion. As the chorus’s coda comes to an end, Audrey and Seymour enter from opposite sides of the screen. As the invasion images behind them grow ever more spectacular, Audrey, Seymour and the chorus sing “Don’t Feed the Plant!” - an urgent plea and a warning to us, their audience, while behind them plays out the nightmare scenario of what happens if you do sell your soul.